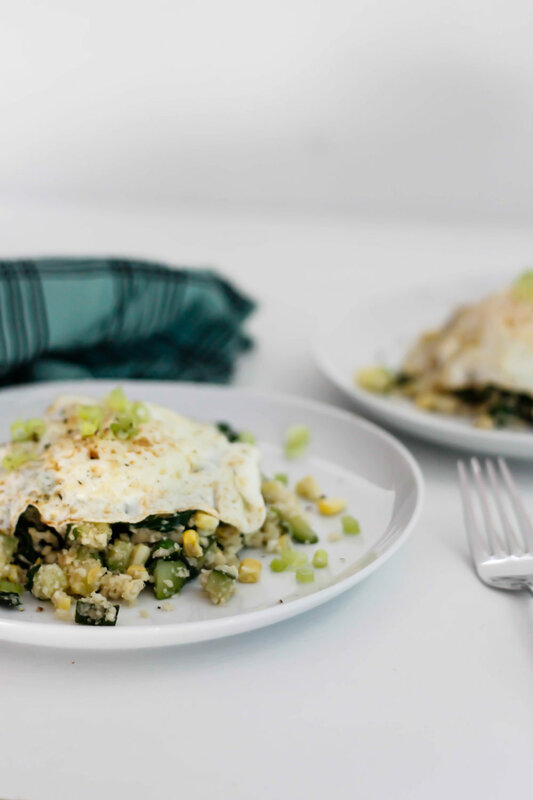 This fried cauliflower rice recipe is just like your favorite takeout but without all carbs! With garlic, ginger and sesame oil, it has everything going on for that classic fried rice flavor. And since fried rice isn't necessarily a full meal, we're going to top it all off with a fried egg. Did I tell you about that time when I sent in a question for Cherry Bombe magazine to ask Martha Stewart during Cherry Jubilee? Ok so that's a thing I did, and they asked her it. A freakin' question of mine somehow made it's way to Martha Stewart to answer. I never get picked for things like this! This was major. So now you want to know, so...what was the question? It's kind of lame, but I wanted to know what Martha's favorite thing to cook is when she doesn't feel like cooking. That's it! It's a simple question for a big problem most of us have. You get back from work and you're hungry and you definitely don't have it in you to cook a full meal. Her answer? Eggs. She cooks eggs. So here's a quick idea for those times when you don't feel like cooking, and the answer is eggs. I love fried rice, borderline addicted, but it's not that good for you. So this is dish has all of those flavors, but instead of rice, we're using finely grated cauliflower. There's no right or wrong way to make this recipe either, so feel free to add the vegetables you have living in your fridge. The recipe is below! Heat the olive oil over medium heat in a large frying pan. Add the garlic, green onion and ginger. Stir until fragrant. Add the cubed zucchini, stirring the vegetables until they're softened. Prepare the cauliflower by removing the florets and blitzing them in a food processor until they’re crumbs. You should have around 3 cups of cauliflower crumbs. Stir the cauliflower into the vegetables, then add the kale, corn kernels, and the peas. Add the soy sauce and sesame oil, and keep on sautéing everything until evenly combined and tender. Season with salt and pepper. Set the fried cauliflower rice aside to fry up a few eggs to put on top. You can do this in one giant pan. Heat the pan over medium-high heat and coat the bottom of the pan with butter. Crack the eggs in a different quadrant of the pan and since it’s hot it’ll go quick. Fry the eggs on one side, flip and cook on the other. 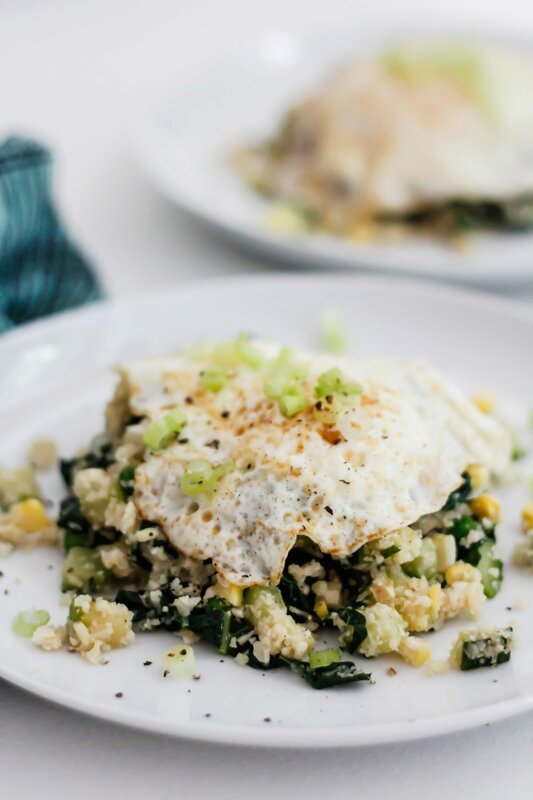 Serve each portion of the fried cauliflower rice with a fried egg on top. Add some more green onions on top to garnish.